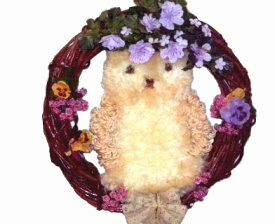 Description: This Owl Wreath features a fluffy body and face, and looped wings made with picots. 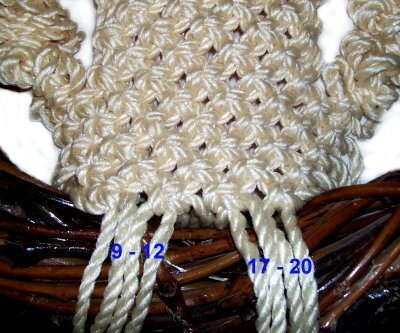 The background is made first, using a very basic Macrame design. It's attached to a circular wreath, but you can use a branch if you wish. The feathers are added to the background, which is time consuming. I strongly recommend you use two colors for the feathers. By adding seasonal flowers and garlands, this Owl decoration is suitable for any time of year. The finished size is approximately 18 inches, which includes the wood wreath. This project is rated easy, but make sure you know how to tie all the knots in the list below. Step 1: To start the base for the Owl Wreath, cut 12 cords, each 3.5 yards long (primary color). Prepare them by temporarily applying tape to each end. You can tie a different mounting knot if you are using a slender ring or branch rather than a grapevine wreath. Pass one cord around the top of the wreath, with the ends heading downward. Fold a second cord in half and place it under the first one, matching the ends so it's centered. Secure both cords to your board. Step 2: Tie a Square Knot using the second cord. 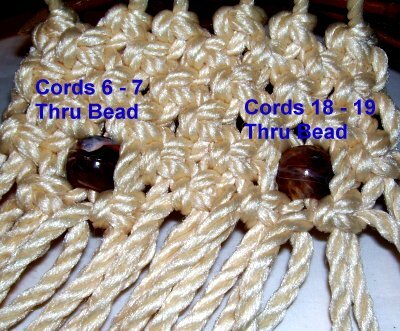 The two halves of the first cord are the fillers. Make sure the knot is tightened firmly. Push the knot up as close to the top of the wreath as possible. Step 3: Repeat steps 1 and 2, attaching the remaining 10 cords to the wreath. Step 4: To make the Face for your Owl Wreath, mentally number the cords. You will be tying several rows of Alternating Square Knots (ASK). 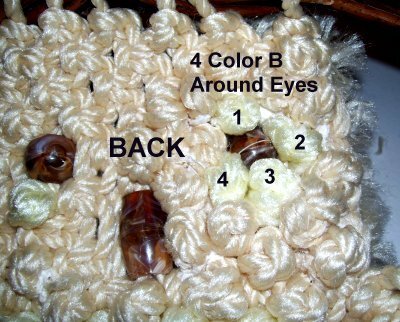 Row 4: Slide cords 6 and 7 through a 20mm round bead for the left eye. Pass cords 18 and 19 through another one, for right eye. 13 - 16, 21 - 24. They should line up with the eyes. Cords 5, 8, 17, 20 are not used in row 4. Row 5: Tie ASK with 3 - 6, 7 - 10, 15 - 18, 19 - 22. These knots should rest below the eyes. 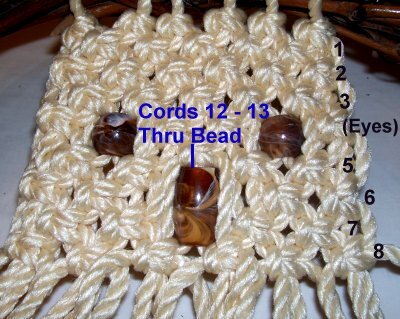 Slide the 32mm oval bead over cords 12 and 13, for the beak. Cords 11 and 14 are not used in this row. Row 6: Tie ASK with 1 - 4, 5 - 8, 17 - 20 and 21 - 24. Cords 9 - 12 and 13 - 16 are not used. Row 7: Tie the ASK with 3 - 6, 7 - 10, 15 - 18 and 19 - 22. Cords 11- 14 are not used. Row 8: Tie ASK with 1 - 4, 5 - 8, 9 - 12, 13 - 16, 17 - 20 and 21 - 24. ALL the cords are used in this row, which should rest below the beak. Row 9: Tie the ASK with cords 3 - 6, 7 - 10, 11 - 14, 15 - 18, and 19 - 22. Step 5: Cut two cords, each 7 yards long. Slide one under cords 1 and 2 and secure it. Tie a Square Knot with the new cord. Cords 1 and 2 are the fillers. 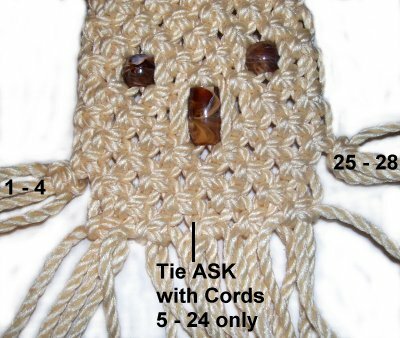 Do the same on the opposite side of the Owl Wreath, attaching the new cord to 23 and 24. Step 6: To start the body for your Owl Wreath, mentally re-number all the cords 1- 28. Cords 1 - 4 and 25 - 28 are for the wings, and are not used for the body. So push them aside for now. Row 1: Use 7 - 10, 11 - 14, 15 - 18, 19 - 22. Repeat rows 1 and 2 at least 3 times, alternating back and forth between the two steps. The last row should be approximately 4 inches above the inside lower portion of the wreath. Step 7: Before you can complete the body of the Owl Wreath, you will need to make the wings, which are small loops called "picots"
You will be tying Half Knots so the wing design will spiral. Mentally number the four cords. 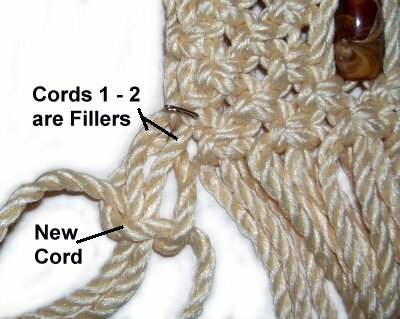 Move cord 1 over the fillers (cords 2 and 3) and under cord 4. Pass cord 4 under the fillers and over cord 1. Pull both working cords to tighten the Half Knot. Left Wing: Locate cords 1 - 4 (long). Cords 2 and 3 are the fillers (short). 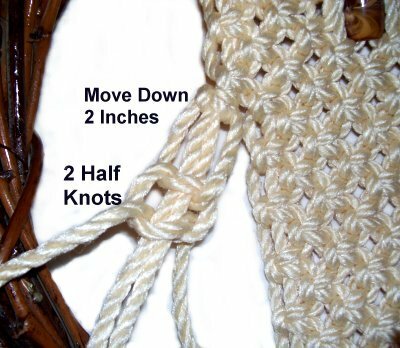 Move down 2 inches and tie two Half Knots with cords 1 and 4. Tighten the knots firmly. 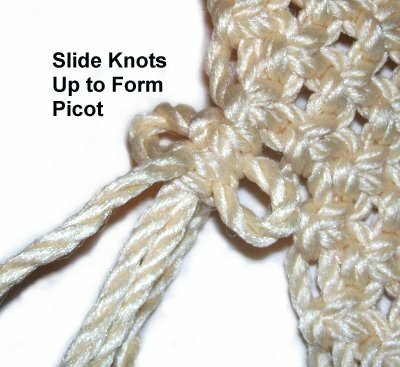 Slide the knots up as high as possible, so they rest next to the knot that connects the cords to the body (see step 9). 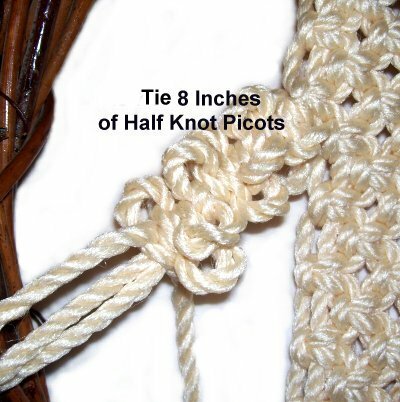 You may need to adjust the picots (two loops) slightly, so they are the same size. 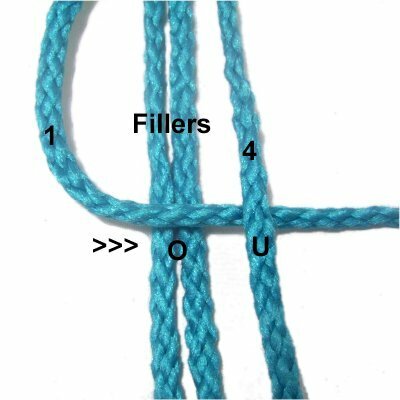 Repeat what you just did several times, twisting the knots slightly as you progress, so the loops face different directions. Make sure you tie 2 Half Knots each time you repeat. Tie enough knots to make the wing 8 inches long. Right Wing: Repeat the previous step using cords 25 and 28 to tie the Half knots. The fillers are 26 and 27. When the wings are the proper size, tie a final knot, but make it a complete Square Knot. Tighten it firmly. Step 8: Mentally number ALL the cords 1 - 28. 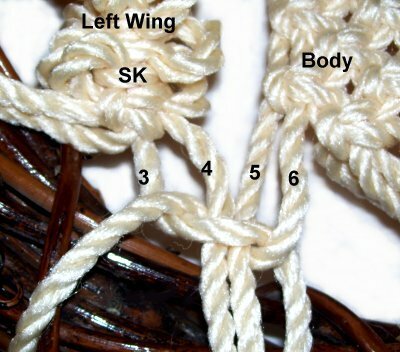 Tie a Square Knot with cords 3 - 6 (cords 3 - 4 are from the left wing). This will connect the wing to the body. Do the same thing on the right side of the Owl Wreath, using cords 23 - 26. Row 1: Cords 1 - 4, 5 - 8, 9 - 12, 13 - 16, 17 - 20, 21 - 24, and 25 - 28. Row 2: Cords 3 - 6, 7 - 10, 11 - 14, 15 - 18, 19 - 22, 23 - 26. Row 3: Cords 5 - 8, 5 - 8, 9 - 12, 13 - 16, 17 - 20, and 21 - 24. Row 4: Cords 7 - 10, 11 - 14, 15 - 18, 19 - 22. Step 9: Move cords 9 - 12 and 17 - 20 over the front of the wreath, and then pull them to the back. 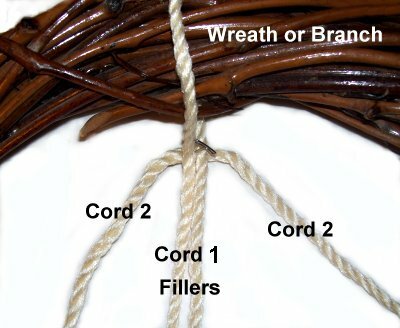 Combine each cord with one of the others in the back of the wreath. 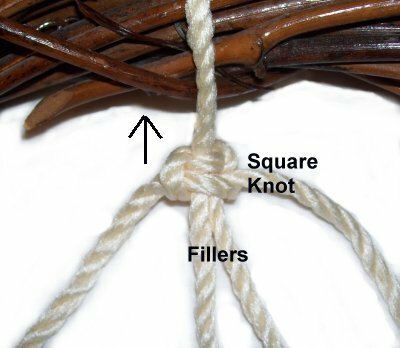 Tie an Overhand Knot with the two cords. Stretch the body as needed to firmly secure the bottom. Step 10: To make sure the knots don't loosen, tie an Overhand knot with the remaining cords. Do not include the ones used in step 9. Try to place the knots close to the Square knots as you tighten each one. 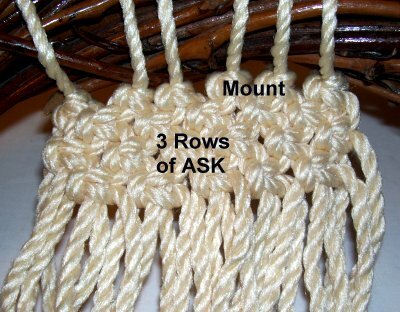 You can add some glue inside each knot, prior to tightening. 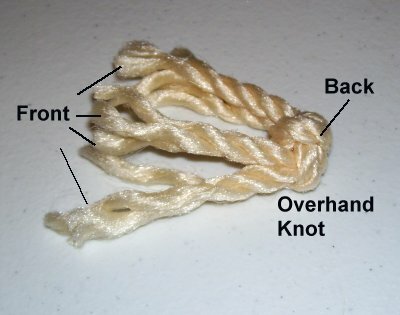 Trim the ends to 2 inches and unravel each one completely. Brush the cords until they are fluffy, and arrange them so the are in the front of the Owl Wreath. Save all the scraps for the feathers. Step 11: You will be making what I call tufts, which will be used for the feathers of the Owl Wreath. To make a tuft, cut 2 pieces of material, 6 inches long. Tie an Overhand Knot using both cords combined, in the center of the cords. 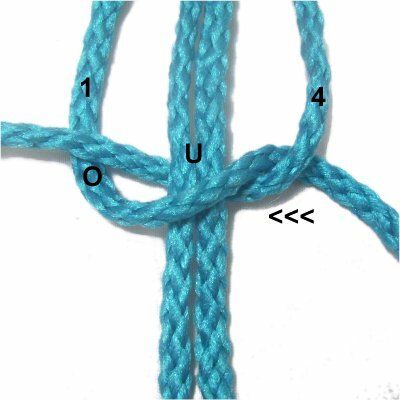 Click on the link or image if you need instructions on how to tie the Overhand knot. Position the Overhand knots so they rest in the back of the Owl Wreath. Pull the cut ends to the front, through spaces in the ASK design, using tweezers or pliers. It's best to start at the bottom of the design and progress upward. 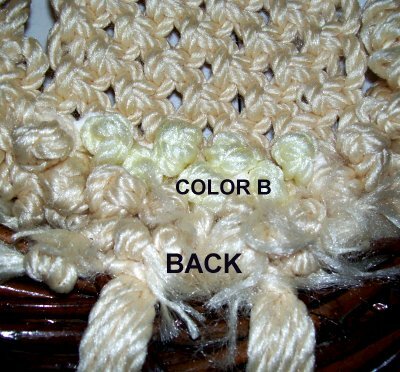 Apply fabric glue under each knot, and pull the ends firmly so the knot rests against the back surface. You can use the two colors in whatever pattern you wish, so there is contrast. 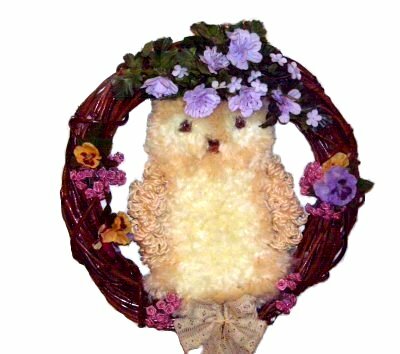 When I made the Owl Wreath shown, I arranged the light color (B) around the eyes and in the center of the body. The primary color used to make the base (color A) was placed along the bottom and sides, as well as the head. 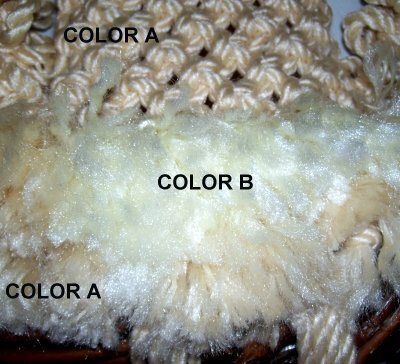 After you bring the ends of the tuft through the space, separate the fibers and brush them until they are soft and fluffy. Trim them to 1.5 inches or less. The ends should stand up rather than lie flat. 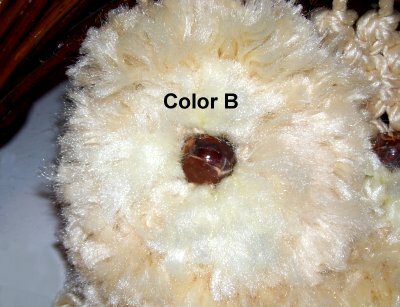 When you get to the head of the Owl Wreath, position 4 tufts of color B as close to the eyes as possible. This image shows the back of the face. Here's a close view of the area around the eyes (front). Brush and trim the fibers as needed over the entire Owl Wreath, when all the tufts are in place. Add artificial flowers, bows, garlands, or other decorations to the wreath. Secure a wire in back to hang it on your wall. Have any comments about the Owl Wreath? Contact Me.